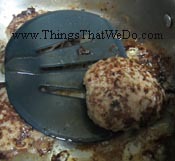 Flipping Burgers with the Oxo Good Grips Pancake Turner – pretty good! Consider this a quick update to yesterday’s disappointing blog review on the Oxo Good Grips pancake turner. 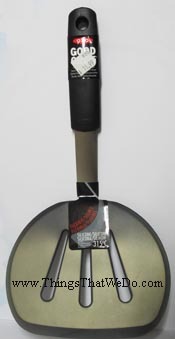 Here I am stuck with this gigantic pancake turner which I’m going to call a spatula since I can’t quite figure out the difference (I can hear the chefs around the world groaning at me already). I’ve now spent my hard earned money on a kitchen utensil that would most likely be collecting dust since the husband has made it quite clear that he doesn’t plan on using it any time soon. So, what am I going to do with it now? It’s not like I’m going to use it in the garden and I certainly can’t play tennis with it although it does look big enough to at least swipe that fuzzy green ball. Finally, ah ha, brain blast moment – we decide to have burgers for dinner tonight. You see, because burgers require flipping and I’ve got a pancake flipper or whatever you want to call it. I got some good ground beef (from the PC Free From line) and added an egg, pureed mushrooms, onion, and garlic along with some basic ingredients to give it a kick (leave me a comment at thingsthatwedo.com and I’ll email you the answer!) and we’ve got ourselves some homemade burgers made with real beef. The husband is kind enough to pat them down and make them into real looking mini burgers. I now bust out the Oxo Good Grips pancake turner and give the burgers a flip in the big stainless steel pan and it worked like a charm! It was super easy to flip those burgers, no fuss at all. I quite enjoyed myself even though I have to admit, it is still a monstrously huge spatula. If I hadn’t used the big stainless steel pan, I don’t think I could have used the Oxo Good Grips pancake turner. So, consider this a quick amendment to my previous review of the Oxo Good Grips pancake turner. I still think modifications are needed to its overall size but it did do a good job at flipping the burgers in the big pan. I guess now I just have to wait for a family member to buy me a new set of pots and pans after all! Let me end off this Oxo Good Grips pancake turner review by stating the obvious. This review is by ThingsThatWeDo.com and no one else. If you see this review anywhere else except on my site at thingsthatwedo.com, know that I have not consented to having any part of this product review (or this website for that matter), to be re-produced, copied, or re-printed anywhere else. It’s sad that I now have to be mindful of using such language to make sure others don’t just swipe away the material that I’ve so carefully typed up. I mean, after all, who’s the one coming up with all these opinions? Me, of course! 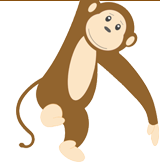 Me, myself, and I here at thingsthatwedo dot com!